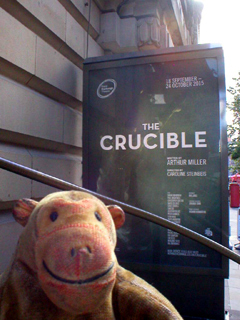 Mr Monkey caught a train into Manchester and scampered down to the Royal Exchange Theatre for the press matinee of The Crucible. Arthur Miller apparently wrote The Crucible, a fictionalised account of the New England witch hunts of 1692, as a response to Elia Kazan's testimony to the House Un-American Activities Committee in 1952. Miller objected to Kazan saving his career by naming other members of the Communist Party. This timing meant that it's always been assumed that The Crucible is really more about the activities of HUAC than about 17th century Massachusetts, though that was denied repeatedly at the time. The Crucible is very loosely based on the Salem witch trials of 1692 with a large dose of artistic license or historical inaccuracy (depending on how you look at it). An obvious diversion from the historical record is making John Proctor much younger, Abigail Williams (one of the bewitched) older, so that their relationship can become a major cause of the whole disaster. Miller had recently had a short affair with Marilyn Monroe, which may have informed this particular bit of artistic licence. In Miller's version of 1692 Reverend Samuel Parris, the slightly beleaguered minister of Salem, surprises his daughter, niece, and a number of other young girls dancing in the woods outside the town. Some of the girls fall into trances, apparently as a result of witchcraft. A rather academic investigator, Reverend John Hale, is called in to study the children with the result that they all wake up and, to avoid admitting they've been dancing naked in the forest, start naming people as witches. As more and more people are named as witches official hearings are held, with the allegedly bewitched girls as the star witnesses whose every word is accepted as absolute truth. Eventually John Proctor attempts to make a stand against the process, with not totally successful results. 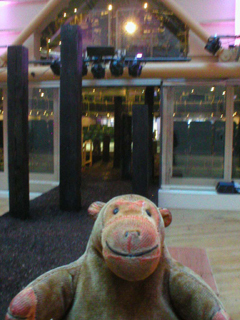 Mr Monkey found that part of the stage set had spilled out into the Great Hall of the Exchange. On one side a massive slab with a cross cut through it marks the start of a stone path into the Theatre; opposite there is a softer, lower path with a series of tree trunks of different sizes. Inside the theatre, the stone of the Church meets the dark forest (in 1692 potentially full of hostile natives and French Canadians) across a central circular bowl which occasionally has a burning circle of light around it. Throughout the play the men all wear modern clothes, showing their relative statuses conventionally. The women wear a slightly odd collection of what appear to be generic antique clothes. Mr Monkey found this slightly jarring at first, but soon got used to it. He later heard a suggestion that the women may be wearing modest clothes mandated in some Fundamentalist Christian groups in the USA. The soundscape is excellent throughout, especially during the build-up to a thunderstorm (Mr Monkey became worried that it was raining outside and that he'd get wet on the way home). There is some strobe lighting during this storm. As Mr Monkey has come to expect from the Royal Exchange, the cast is excellent and obviously know what they're doing. Mr Monkey was particularly impressed by the four he saw as the most important characters. Tim Steed is very good as the Reverend John Hale, a character who is out of his depth almost from his first appearance. Stephen Kennedy's Reverend Samuel Parris starts as a bit of a bully but ends anguished by what his niece has done to his community. By the end of the play these two know something is going very wrong, but lack the strength to do anything practical about it. Peter Guinness as Deputy Governor Thomas Danforth is a brutally ruthless and efficient politician masquerading as a fair judge; when his conscience raises its head for a moment he stamps it down. 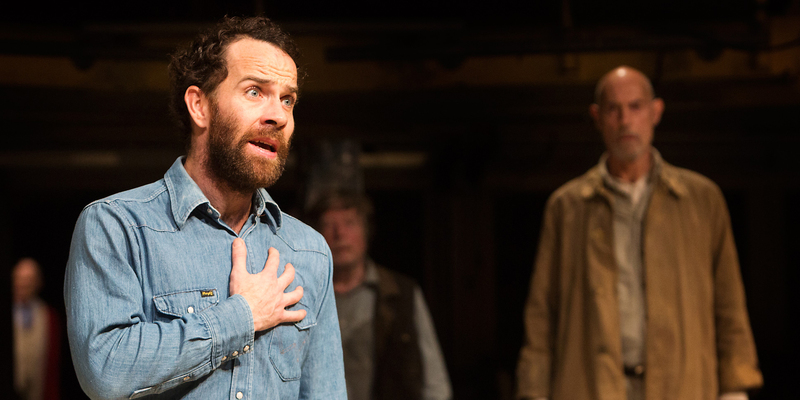 Surrounded by this misguided trio, Jonjo O'Neill is convincing as John Proctor, who eventually is forced to choose between being hanged or saving his life by suggesting other people for persecution. Mr Monkey suspects that Proctor got some of the best lines because Arthur Miller identified rather closely with him. The rest of the cast support these four very well; Mr Monkey was particularly taken by the timing of Sam Cox (Giles Corey) and by Matti Houghton's desperation and resignation as Elizabeth Proctor. While Mr Monkey thought that there was a little too much water on the stage in the final scenes, he thoroughly enjoyed this excellent production of an emotionally draining play. Mr Monkey heartily recommends it to anyone who wants a rather scary three hours considering moral dilemmas and the paranoia of a society that is prepared to destroy itself to save itself. 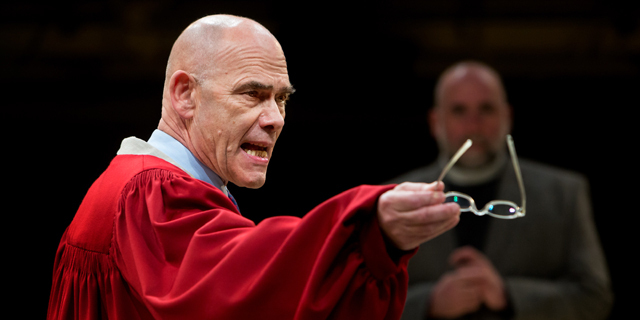 The Crucible runs until 24th October 2015.